The first rule of journalism is: be fresh. Nobody likes old news. So thank goodness I'm not a journalist. Because this blog post publishes school Management Information System (MIS) market data from September 2016, which I've been sitting on since December. But enough people have asked me about school MIS stats recently that I felt shamed into updating this series of "MIS Market moves" posts I started in 2014. The following Tableau Story takes you through the main headlines in the market. The first visualisation (or "Viz" in Tableau-speak) is the most flexible: you can use the menu options to filter the data by school phase and MIS vendor. Below the Tableau Story, you'll also find my commentary on the state of the market. So as is seemingly the case every year, the biggest story is... there isn't a big story. (Don't get me wrong, there are medium-sized stories, so please keep reading, Just not a really big one...). The MIS market moves slooooowly; changes in market share of 0.5% or greater (basically, a move of +-100 schools) are unusual, and therefore can be considered a BIG DEAL. With that in mind, the big risers are Scholarpack (460 schools up from 305) and Pupil Asset (261, up from 119). It's no coincidence that both are proudly primary focused - it's been apparent for a while that primaries are happy to accept a thinner product than secondaries, providing it is tailored to their needs. They're also apparently quicker to perceive the benefits of the cloud; while RM (by far the largest cloud vendor by market share) serves both primaries and secondaries, its customer base is mostly in the primary sub-sector. Bromcom also deserve an honourable mention for rising from 93 to 155 schools; the biggest increase among MIS suppliers working across all phases. However, individual vendor data tells only half the story. When you aggregate and compare cloud and non-cloud systems (the second viz on the Tableau story), you see that the market share of cloud vendors continues to rise significantly - up from 11.6% in 2014 to 15.9% in September 2016. In a slow-moving sector, that's a sure sign that something is happening. And actually, these figures understate the rate of change, since I've not been able to count Progresso schools in the "cloud" column, and recent high-profile MAT procurements from Harris (who moved to Bromcom) and AET (who moved to Progresso) are not reflected in the data. Even more telling is the third viz, which shows how the net gains are all from cloud vendors. 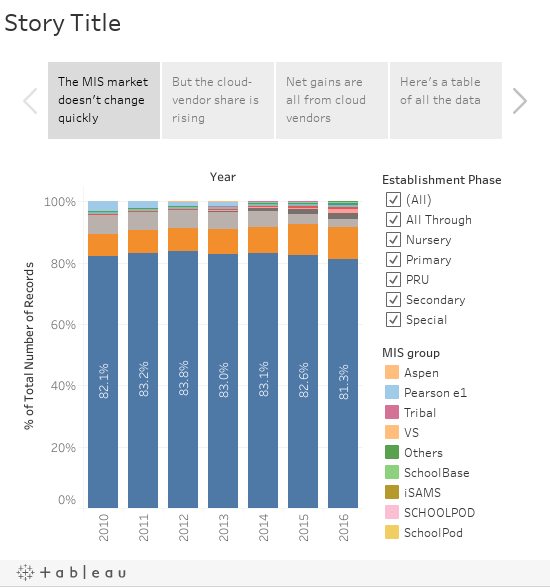 There are, in fact, fully nine cloud MIS suppliers with 25 or more state school customers, compared with just two locally hosted systems left in the market (SIMS and CMIS). It's in this context that the recent big announcement from SIMS of a move to the cloud in 2018 should be understood. Of course, many schools still love SIMS just how it is today, but clearly the company's future health is tied to how SIMS measures up to the ever growing crop of cloud contenders.